Nikky-Guninder Kaur Singh is Professor at Colby College, where she holds the Crawford Family Chair in Religious Studies. She has published extensively in the field of Sikhism, including books entitled Of Sacred and Secular Desire: An Anthology of Lyrical Writings from the Punjab (IB Tauris, 2012), Sikhism: An Introduction (IB Tauris, 2011), Cosmic Symphony (Sahitya Akademy, 2008), The Birth of the Khalsa (SUNY, 2005), The Feminine Principle in the Sikh Vision of the Transcendent (Cambridge University Press, 1993), Sikhism (published by Facts on File, and translated into Japanese, 1993), The Name of My Beloved: Verses of the Sikh Gurus (HarperCollins, 1995; Penguin, 2001), and Metaphysics and Physics of the Guru Granth Sahib (Wellesley College, 1981). Professor Kaur Singh was born in the Punjab, and came to finish a girls’ high school in the USA. She received her BA in Philosophy and Religion from Wellesley College, her MA from the University of Pennsylvania, and her PhD from Temple University. 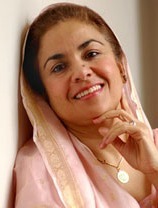 She has received many honors from the Sikh community for her distinguished scholarship including the Outstanding Accomplishments Award (presented by Sikh Association of Fresno, California), Sewa Award by the Sikh-Canadian Centennial Foundation for Scholarship on Sikhism (Toronto), and Guru Gobind Singh Foundation Lecture and Award (Chandigarh, India). Her views have also been aired on television and radio in America, Canada, England, Ireland, Australia, India, and Bangladesh. Professor Kaur Singh serves as a trustee for the American Institute for Indian Studies, and is on the editorial board of the History of Religions, the Journal of the American Academy of Religion, and Sikh Formations: Religion, Culture, Theory.